Chateau de Soleil, House of the Sun, located on 6 acres is a home like no other in the Black Hills. With 4,100 sq ft of exceptional decor plus 2000 sq.ft. outdoor deck this home and Tree house are marked by superior quality furnishings and exquisite professional designer appointments. 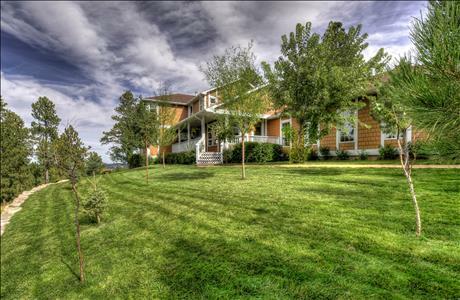 Located in beautiful Boulder Canyon, minutes from Deadwood, Lead, Sturgis, Spearfish, Rapid City, and all other communities. The Chateau will serve as a perfect vacation hub to all area attractions and special events through-out the Black Hills area. Giving our guest the best we have to offer to make a lasting memorable vacation we added to this beautiful home a 400 sq ft tree house for adults and yes kids too! This tree house was built to give the unique experience like no other in the Black Hills. If you have never walked through a 5 foot round door or been in a house built in the trees, this will be the highlight of your stay. The builders of this tree house had quite an imagination on the exterior and interior design and is sure to please anyone. We understand that our guests when planning a vacation or just a getaway are looking for a place that is comfortable, unique and memorable so let Audrey and I help you with planning a wonderful vacation. 3 Stall Garage, full kitchen in the main house and a kitchenette in the treehouse. Rollaway available. The Hobbit Tree House has a game room, 3 decks, a gas grill and a fireplace. RENTAL POLICY: We do not rent to any of the following: Weddings, Bachelor Parties, Bachelorette Parties or anyone under the age of 25. PET POLICY: No pets are allowed at this property. Cancellation policy is 60 days prior to arrival. Black Hills Central Reservations offers Travel Insurance. We advise that you purchase travel insurance to protect your vacation. STURGIS MOTORCYCLE RALLY CANCELLATIONS: Reservations are non-refundable at any time. Renter must be 25 years of age or older to rent the Chateau. 1st night non-refundable rental fee plus tax is required for the initial payment with the balance due 60 days prior to arrival. No refunds are given after full payment is made. Reservations made inside the 60 day window need to be paid in full and no refund if canceled. Cleaning Fee of $165 will be collected at the time of booking. $500 Damage Deposit (refundable is no damages) will be collected by the homeowner. STURGIS MOTORCYCLE RALLY DEPOSIT: Full, non refundable payment is due at the time of booking.STURGIS MOTORCYCLE RALLY CANCELLATIONS: Reservations are non-refundable at any time. Checkout time is 10:00 a.m. MT: There is a small list of items that need to be done upon checkout. If you wish not to do them, for a fee of $75.00 we will take care of these items for you. Please let your booking agent know if this is a charge you would like to be added to your reservation. CHECK OUT LIST: All garbage in home and outside bagged and tied. Scrape off grill Run dishes through dish washer and put away Leave all sheets and pillow cases on beds. If rollaways are used leave them out. Leave all bath towels on floor in laundry room. Make sure remote controls are by the tvs Turn down fireplace to 50 degrees in winter, turn off in summer. Leave all furniture as you found it. Late check out will result in $40.00/hr charge unless prearranged. NO SMOKING ALLOWED in this home. Please dispose of cigarette butts properly, not on the ground. Please put shoes in Shoe box in garage. Excessive dirt brought into home may have additional charges. Try to limit number of vehicles you bring. Parking is not allowed on the streets. Follow hot tub sanitation rules during your stay. For a more enjoyable vacation there is a NOISE AND NUISANCE ORDINANCE in this development that is enforced, as these nuisances have been reported to the authorities in the past. Civil fines and penalties do apply, as well as any expenses incurred by the homeowner due to guests negligence. Ignoring these rules may also result in IMMEDIATE EVICTION FROM THE PROPERTY AND NO REFUNDS. Please follow hot tub recommendations for sanitation reasons. Please observe the 15 mph SPEED LIMIT for all vehicles including off road recreational vehicles. Paved roads are not to be used for recreational use.......No reckless driving on the roads. No camp fires or fireworks and always be aware of the fire conditions in the Black Hills. Noise needs to be kept to a minimum after 10 pm. BE CONSIDERATE of the neighbors and and avoid ruining your own vacation by following the simple rules above. Children welcomed. We do have a playpen and highchair available.